Farrar, Straus and Giroux (BYR), 9780374304447, 40pp. In addition to Queen of the Hanukkah Dosas, Pamela Ehrenberg is the author of the young readers novels Ethan, Suspended and Tillmon County Fire. She now lives in Washington, DC, where she works at the National Association for the Education of Young Children and lives with her daughter and son near the National Zoo. Anjan Sarkar was born in the UK and his heritage is mixed British and Indian. Anjan has created work for children’s books, animation, and advertising. Anjan works from a little studio in his home in Sheffield, England. He lives with his wife and two young children. 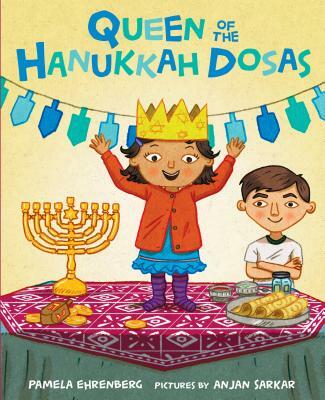 Anjan is the illustrator of Pamela Ehrenberg's Queen of the Hanukkah Dosas.